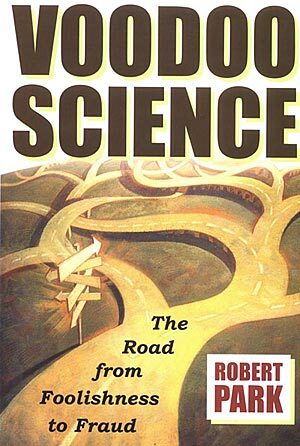 In Voodoo Science, The Road from Foolishness to Fraud by Robert Park we learn details about historical and current pseudoscience and how specific examples of junk science negatively affect all of our lives and waste money. He discloses how the media, entrepreneurs, politicians, judges and scientists perpetuate scientific fraud because of ignorance, personal achievement or economic gain at the expense of mankind. Voodoo science is found in our everyday lives and negatively affects us by deceiving and restraining the scientific truth from the people. Robert Park discusses junk science in its finest forms such as consumerism associated with magnet therapy, Vitamin O, homeopathy and herbal therapy. He continues discussing the fraudulent and pathological science behind human spaceflight, the International Space Station, the physical impossibilities of Joe Newman’s perpetual energy machine, Fleischman’s and Pons scam at cold fission technology, hydrogen energy, alien abduction, Roswell, UFO’s, Star Wars and the X-ray laser; just to name a few. His writing is enlightening since it brings to mind the grave condition of America’s present educational system and how the system has historically and is presently failing to educate our citizens with a superior scientific and mathematical education. We are taught junk science through our basic school systems and the media. There are numerous examples that reveal members of our judicial and political systems are subject to ignorance and their actions cost American taxpayers billions of dollars pursuing garbage and fraudulent science. Truthfully, the real amount may cost taxpayers trillions of dollars. Pseudo-scientific ignorance in the 21st century America is considered comparable to the Salem Witch Trials of the 17th century. There really is not much difference between the two except they occur within five hundred years of one another. Two additional themes contained in this book are the monumental cost and waste of America’s economic resources that are the result of false beliefs, pseudo and junk science and the role of the media in perpetuating the false unscientific claims behind alleged science. There were and are presently billions (perhaps trillions) of dollars spent on different types of voodoo science. For example, Utah’s legislation supported research funding for the development of cold fusion which is impossible based on our current scientific understanding of the laws of physics. Even though cold fusion is impossible, the legislators supported 5 million dollars to fund Fleishman’s and Pons cold fusion claims notwithstanding the laws of physics. The International Space Station, Star Wars and the X-Ray are other examples of flawed governmental judgment; skeptical scientists warned our politicians of the impractical and unscientific justification for these programs to no avail. Thus, our government wastes billions of dollars on pseudo-scientific expenditures for programs destine to provide nothing but an economic stimulus for those participating and supporting the program efforts. The American media appears to continue the William Randolph Hurst brand of “yellow journalism” where sensationalism is more important than scientific fact and truth. Presently, the media’s economic goal appears to sell advertising space and time for the shareholders. After all, isn’t the entire pool of contributor’s to the pseudoscience mania in pursuit of greater economic achievement? The media is directly involved in the perpetuation of pseudoscience by inept reporting of the scientific truth as well as providing television news and entertainment which misleads the public. Robert Park eloquently explains that early in the space exploration program, robotic technology was found superior to human space exploration. American robotic technology paved the way for space exploration behind the scenes concurrently with manned space flight on television at a cost of millions to taxpayers. America’s pursuit of walking on the moon revealed that sending men to the moon was not a cost effective manner in which to explore the moon. The International Space Station has revealed that human bodies having evolved with gravity do not function well without gravity. This is the most profound experimental finding learned on the International Space Station “experiment.” Our evolutionary design is such that our bodies need exposure to earth’s gravity to function properly. A most profound realization of the scientific manipulation of the American people is found within John Glenn’s return to space on the space shuttle Discovery, thirty-six years after his Mercury flight. After thirty-six years and billions of dollars spent on the space shuttle program – humans have gained an additional eighty miles beyond the Mercury capsule orbit. American’s have merely had their tax dollars utilized to stimulate the economy and create high paying scientific and support related jobs for naught. To date, what is gained from the human exploration of space? The answer may simply be that humans are not physically adapted to safely or inexpensively explore or operate in space; the use of robotic technology and satellites are safer and more cost effective. The original Voyager unmanned spacecraft is traveling outside our solar system although no longer transmitting data to earth. There are other spacecraft too. As you read this, humans are exploring the universe through robotic technology including satellites and have done so since 1969, without humans present inside the crafts! Perhaps our educational system is in-part to blame for our fraudulent science. After all most of our teachers, politicians, judges and leaders were predominantly educated here in the American school system. They have failed to comprehend simple, logical mathematical and scientific principles. Their actions clearly show they do not understand the basic scientific principles or the subject matter was never presented to them (and neither do I fully comprehend them). Are the business majors trumping the science majors as our leaders? Also, Congress hears testimonials from scientists who have direct economic ties to their very supporters and research. The scientists have their futures tied to the economic gain resulting from their testimony and research. Are the scientist’s economic ties and the politician’s ignorance clouding the science? If so, we surely have a monumental problem to overcome. Anthony R Pratkanis, associate professor of psychology, University of California presented several tactics to sell a pseudoscience flimflam, two of which can be applied to our space exploration program. First, is a phantom is created where an unrealistic goal is proposed if we chose to reach that goal. In this case, the goal was for humans to explore space – when in fact we cannot safely do so because of the dangers associated with the harsh environment in outer space. We understood this early in the space program when we began the simultaneous development of unmanned satellites and robotic technology to explore the outer plants at the same time as the Apollo program. Secondly, a politician, our President John F. Kennedy informs Americans that we are going to walk on the moon in ten years - which ultimately leads to politicians proposing that humans explore Mars. Our politicians create a rationalization trap by committing us to believe that humans can safely travel or work in space because we walked on the moon, traveled in orbit around the earth and lived on the International Space Station when science clearly show human space travel is too dangerous for humans. Remember, we lost two space shuttle crews and one Apollo crew within the confines of our atmosphere! We rationalize that space travel is safe – when it is not safe. Politicians should not dictate what science can accomplish for the people because science builds on past concepts. Science should dictate what politicians can accomplish so that the perpetuation of impractical costly expenditures does not continue to consume and waste our world in efforts that prove futile to all mankind. Perhaps, someday “Buck Rogers Spaceflight” will become a reality for humans – but we are not scientifically equipped for this travel as of now. Charles Peden: Is He the Real Thing??? Paranormal experiences and the great skeptic.